KORINE: Do you feel like there’s any type of magic to Los Angeles still? Is it as interesting as old Hollywood? ANGER: Uh, no. [laughs] I hate to say that, but the past was much more fascinating. I don’t particularly care for any of the current crop of actors. I don’t particularly care for any of the current crop of directors. But I have a lot of friends who are editors, and there are a lot of technical things going on here that are interesting. KORINE: What about your dreams? Can you remember your dreams? This week Mike, Iris and guest co-host Jon Cross talk about the Harmony Korine directed Gummo (1997). Our special guest for this episode is Nick Sutton. Nick played the part of Tummler and talks to us about the time he spent on the film and how he feels about it in 2014. The interview begins at 14:36. Harmony Korine recently spoke to The Organist in a candid telephone interview. Korine Speaks on his recently re-issued novel A Crackup At The Race Riots aswell as, what he calls, “The Granny Torture Tapes” which perished in one of the many fires it seems Korine has succumbed to. The Organist podcast can be heard below – the segment with Korine can be heard around the 17:25 mark. After grossing more than $25 million at the box office worldwide, Spring Breakers is finally coming to DVD and blu-ray in the US on July 9th. You can pre-order your copy now via Amazon. The UK DVD hits stores on August 12. The Dinner Party, a podcast interview series, have uploaded their latest episode onto SoundCloud and it features an interview with Harmony Korine – among others. For the interview with Korine, skip to around the 32 minute mark. He speaks on Cassavetes’ film Husbands and the unrealized Fight Harm project. 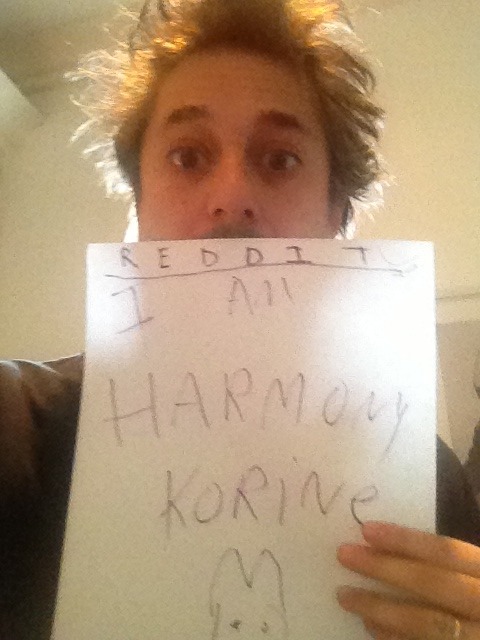 Click here to go to the Reddit page for an AMA with Korine in which fans and the general Reddit public were invited to ask him questions. Be warned, there’s a lot of jesting. Go behind the scenes of Spring Breakers with Vice Magazine. As a companion piece, check out this interview with Harmony done by Vice.